The reason I enjoy reading Ohiyesa's books so much is his unique perspective, one that came from living in two different worlds, native and mainstream American. This book traces his life in the first world, growing up in a Sioux camp.Most of his account is set in Canada where he went into exile after being separated from his father and siblings following the 1862 Dakota War. Before Indian Boyhood, I read Old Indian Days and my favourite story in that book was based on this event; it was interesting to find out that the author was more closely connected to it than I imagined. I guess I should have read Mr. Eastman's biography more closely (and perhaps I should be referring to him as Dr. Eastman instead).As always, his writing is honest and his depiction of Sioux life without pretension, whether he talks of hunting or making sugar, feasts or evenings in the lodge with his grandmother and uncle. The latter comes across as a truly admirable human being, whether because of his skill as a hunter or his simple but honest opposition to slavery. While Dr. Eastman writes from a clearly Sioux perspective, he isn't really biased either as in his retelling of a Cree legend where the Sioux are the antagonists. I like that even though the philosophies here are meaningful and spiritual, they avoid cliched mysticism as if their spirituality exists only to offer solace to jaded modern readers. At the same time, these are ideas that you can appreciate learning from, like when Ohiyesa's uncle says, "I think we are really bravest when most calm and slow to action. "The book is also full of homely pleasures, like the hilarious story about Chadozee and the bear (especially the bit about the bear scowling at him :P) as well as the ones Smoky Day (whom I first met as a fictional character in Wigwam Evenings) tells. I love that in Sioux society, solitude is not necessarily a bad thing. As someone who enjoys the refreshing calmness of being alone and is often questioned about this supposedly strange habit, I am grateful for Ohiyesa's defence of it. This book also helped me understand many of the things Dr. Eastman talks about in The Soul of the Indian. On the other hand, the author's narration feels a little abrupt sometimes, especially when he shuffles between the first person and the third person. Reading this book creates a strange sort of wistfulness. Ohiyesa never paints his life as some sort of New Age hippie paradise - Indian life back then was clearly difficult and not always simple. And yet, he makes it clear that it was a good life. The sheer freedom without avoiding a sense of duty, the luxury of solitude combined with the warmth of community living is something I wish still existed. This book is a firsthand account by Eastman, of his life from his birth, until his father returned to the community. An easy read, the writing isn't complicated by jargon. Overall, this book provides useful information concerning the worldview of Plains Indians during the mid to late-nineteenth century, as well as providing some firsthand accounts about the way Indigenous Knowledge is transmitted to children. Learning in the field next to his uncles and aunts, elders and mother, Eastman provides a unique perspective when contrasting this against the residential school model. What I found particularly relevant are the lessons that Eastman learns in his adventures, and how pervasive respect is in the relationships between children and their families. This is a first-hand experience story written many years ago by a Sioux Indian, Ohiyesa (Charles Alexander Eastman, his white man's world name) recounting his boyhood as he was raised in the traditional Sioux Indian way. It is fascinating to learn how this child grew thoroughly immersed in the Indian world and then went on into adulthood and assimilated into the white man's world as a highly educated doctor and published author.Originally published in 1902 by Charles Eastman recounting his traditional Dakota Sioux childhood. Mr. Eastman lived 1859 to 1939 so he was intrinsically involved.Indian Boyhood is the story of a disappearing culture even during this recounted childhood, and it is wonderful to see that today's publishers and editors see the value in a resurgence of this man's story and are adapting and publishing it for today's children to read and learn about original Americans.While the book doesn't have much "girl appeal," it is certainly a valuable source of information for any child. Targeted for age four and up, the text flows easily and simply states in a very simple form what transpires as the boy grows until he leaves with his re-discovered father for the white man's world. The illustrations are very well done and capture the essence of the Indian life the story details. I like that the book opens with pictures of the author in traditional Indian clothes as well as his white man's world clothes. At the end of the book, there is a list of explanations that helps to understand the illustrations.A very good book for simply learning about the young Indian boy's life. A must for school libraries.DISCLOSURE: I received a complimentary copy from Wisdom Tales to facilitate this review. Opinions are my own. I was not compensated for this review. I wanted to read this book after watching a movie about Eastman's life. I hope to read more of his writings. The book starts off well with an interesting foreword by Charles Trimble, a registered Oglala Lakota, that identifies the specific nation that Ohiyesa/Eastman was part of. In the foreword he presents the historical context and sets the scene for the book and while not graphic, he is unflinching in how he presents the events that shaped Ohiyesa/Eastman’s life.“In the so-called Indian Uprising of 1862 the Dakota people rebelled against white incursions onto their lands and the government’s withholding of treaty-guaranteed rations that left them starving. Ohiyesa/Eastman’s extended family fled to Canada to escape the U.S. Army, which was hell-bent on brutal vengeance…”This foreword is followed up by an editor’s note in which Fitzgerald is upfront about what changes he has made to the original text. 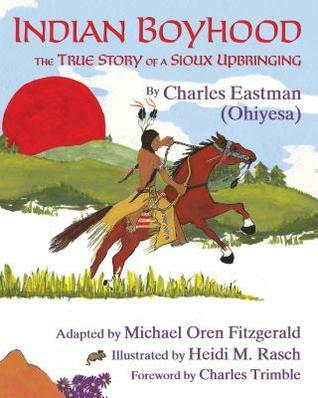 The story and text is adapted from Ohiyesa/Eastman’s autobiography. It seems most of the text was simplified and shortened to make it more accessible to younger readers and to fit it into this format. It appears that all involved with the project are hoping to spark interest in Ohiyesa/Eastman. In a brief footnote Fitzgerald also explains that he is using the term Sioux because it is the term in the original work. He goes on to at least acknowledge that the term is European-American and lists the Nations that fall under that category. At the end of the note Fitzgerald claims that all royalties are being donated to various American Indian causes. We’ll have to take him at his word on that.The story itself is an interesting look at the Sioux way of life and follows Eastman through the first 15 or so years of his life. The text is fairly short which really makes it best suited to young audiences (first and second grade, probably even kindergarten). In some places I was left wanting more information and detail. That is part of the purpose of the book, but I do think there could have been a little bit more. It paints an idyllic and fun life for a child with hours of play and learning skills like tracking and hunting. But he also shares times that the families went hungry. I do wish the story had continued further and addressed some of his time being schooled in the white town he moves to with his father.The illustrations are pretty and are reminiscent of Paul Goble’s illustrations. I am not familiar with art from those nations or that area and the similarity makes me wonder if it copies a style seen in Sioux art. There is a page of notes on the illustrations that explains what objects in the illustrations are and their significance. I’m a little put off by the last picture that, according to the notes, is an “imaginative image of Eastman”. It hits a little close to stereotypes, even if its depiction is accurate.I have mixed feelings about them using Ohiyesa’s white name as the author and including his given name in parentheses. I am glad they included it, but I am left wondering which he would have preferred and which is more culturally appropriate (I suspect the given name).The reason I reviewed this book, beyond it being interesting, was that I am looking for materials for our third grade class which studies the Sioux. While I am not qualified to make decisive judgements on books about Native Nations, I have to make some calls on what materials to purchase. I think for a general collection this would make a great addition. It’s a little idyllic, but taking into account the fact that it’s true and the book’s notes outside the text, it seems well rounded. I also think it would make an appropriate addition to a home or classroom library for the same reasons. I prefer something like this over presenting made up “native American” legends or stories that are told by outsiders. I am going to pass it along to our third grade teachers, but I suspect the text itself may be a little bare bones for their tastes. I would recommend using it in a classroom in conjunction with both other materials (maybe even Eastman’s original books) and being sure to read the notes and foreword together. Bracketed with background information about the author, illustrator, and supporters of this book, Indian Boyhood presents a very simply told story for young children, filled with tiny details of text and illustration that imply a much larger tale. The writing is smoothly edited from Charles Eastman’s original text by Michael Oren Fitzgerald, combining the sense of a children’s picture book with the depth of genuine cultural difference and experience—a difference born of time, location and history, and beautifully portrayed.Adults should read and enjoy the forward and preface—a wonderful introduction to the author and editor—while children will turn, of course, to the pictures first. But both should stop at the photographs that come before the story—two simple images that tell a tale of time and people lost, yet never gone.“What boy would not be an Indian for a while…?” asks the author as his story begins. An enticing image of horse and rider, plain and shining sun, invites the reader to turn the page. But even the images are filled with secrets in this book, making it a treasure for older children too, to search and find how a tipi is decorated, why a family would flee, how a child would be hidden in a tree…The story’s told in a pleasingly authentic voice, for all its simplicity, and rings gorgeously true. The Indian boy learns equally of hunting and herbs, an interesting background when history tells us he grew up to train as a doctor in the white man’s world. There’s beauty in knowing this changing world didn’t change him—just became a part of him.I really enjoyed this book and would love to share it with a child, growing, as all of us do, in a world that never stays still, and learning, as all of us should, to wait before leaping to judgement.Disclosure: I was given a copy by the publisher, Wisdom Tales, and I offer my honest review. I had to read this book for my Native American literature course. The culture of the indigenous people is extremely different from ours. It was amazing to read about some of the experiences Ohiyesa had during his time with his tribe. Talking about the rite of passage into becoming a warrior was so interesting because it polarizes strongly with what I have to do today to be considered an adult. It's also similar in some ways. Ohiyesa must make an emotional sacrifice and be disciplined to be considered a warrior. I personally must sacrifice time and energy to build a career and also be disciplined (albeit in a non diet and exercise oriented way). I found inspiration in reading about the culture of the native american people. I'll try to incorporate some of what I read in my own work. My friend and I joke about what our spirit animals are. I wonder if our culture today would still use spirit animals in everyday conversation if we were closer to animals too? Instead of horoscope matchings for dates you would have 'field mouse' and 'guinea pig' as being compatible. I could see some appeal with that. All in all I enjoyed the read a lot although there were some intense / painful moments. A definite worthwhile read if you're interested in primitive cultures or even living minimalist. "Indian Boyhood" is a picture book for ages 4 and up and it's an edited version of Charles Eastman's autobiography about his Dakota Sioux upbringing. Charles Eastman, or Ohiyesa, lived from (1858-1939) and wrote eleven books from 1902-1918. This book tells how he was raised by a grandmother due to losing his parents while very young and how they were forced off their land, but also about his wild-animal pets, hunting, and learning to be a warrior.The illustrations complement the text by showing details of Indian life that aren't specifically mentioned in his narrative. Information about these extra details is included at the end of the book. The illustrations are done in the same style as that shown on the cover. All royalties are donated to various American Indian causes. I'd recommend this book to children interested in what a Dakota Indian childhood was like in 1858-1873.I received this book as a review copy from the publisher. I really loved this book! Charles Eastman (Ohiyesa) was a Woodland Sioux who was raised in the traditional way until the age of 15. This is his account of those years. There are chapters about his grandmother, hunting, sugar collecting, games, legends, evenings around the fire, and just life in the woods in general. It was originally written for children so it isn't stuffy or boring, but it isn't too simplistic either. It was a very interesting and pleasant read. It took me to another time and culture. I plan on reading more by this author. Written in 1902 and still in print I believe, though my copy is from 1930. Very readable; possibly originally juvenile nonfiction. Recommended for people who want to know what the young American Indian contemporaries of Laura Ingalls Wilder were doing while she was in the prairies. Lots of detail about Sioux daily living, games, food, contests, rituals, courting and governing. The author lived "the wild life" into his teens, when his life changed forever and he joined "civilization". I will be looking for more of Eastman's (Ohiyesa's) books. I received this book as a First Read. It's a good adaptation of Eastman's original book and a good intro to Eastman's boyhood life. It's also a good intro for young readers to Native American history. The illustrations are detailed and have a great folk quality to them. This book will inspire young readers as well as older readers to learn more about both Eastman's life and Native American history. I received my copy via Goodreads giveaways. A beautifully-illustrated adaptation from the original, "The true story of a Sioux upbringing" is a short, sweet, charming tale of a boy's youth (to age 15) as a northern-prairie-dwelling native American. Heidi Rasch is to be complimented for this edition's appropriate, helpful, enjoyable artwork. A firsthand account of Santee Dakota life in the mid 19th century. Well-written (possibly with the assistance of Ruth Alexander, a university English professor? ), descriptive, and interesting. Amazing insight into the journey of an assimilated Sioux.